The Payment Card Interchange Fee and Merchant Discount Antitrust Litigation is a United States class-action lawsuit filed in 2005 by merchants and trade associations against Visa, MasterCard, and numerous financial institutions that issue payment cards. The suit was filed due to price fixing and other allegedly anti-competitive trade practices in the credit card industry. A proposed settlement received preliminary approval from the judge overseeing the case in November 2012 but the majority of named class plaintiffs have objected and many have vowed to opt out of the settlement. In December 2013, U.S. District Court Judge John Gleeson approved a settlement in the case that amounted to $7.25 billion. The settlement lowers interchange fees for merchants and also protects credit card companies from being sued over the issue again in the future. 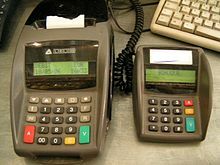 Terminals for swiping credit cards, and origin of the term "swipe fee"
Plaintiffs allege that Visa, MasterCard, and major credit card issuers engaged in a conspiracy to fix interchange fees, also known as swipe fees, that are charged to merchants for the privilege of accepting payment cards, at artificially high levels. In their complaint, the plaintiffs also alleged that the defendants unfairly interfere with merchants from encouraging customers to use less expensive forms of payment such as lower-cost cards, cash and checks. On 27 November 2012, United States District Judge John Gleeson entered an order granting preliminary approval to a proposed settlement. Speaking of the settlement Gleeson said, “I don’t mean to suggest for a moment that there are not a number of issues that are going to require significant scrutiny. I’m not persuaded that the deficiencies are the obvious deficiencies that ought to derail preliminary approval.” Gleeson's approval was important because it allows the potential seven million or more members of the class to begin the process of opting in or out of the settlement. The settlement provides for the cash equivalent of a 10 basis-point reduction (0.1 percent) of swipe fees charged to merchants for a period of eight months. This eight-month period would probably begin in the middle of 2013. The total value of the settlement will be about $7.25 billion. This amount could be decreased based on the number of plaintiffs who opt-out. Class members can opt out of the monetary part of the settlement in addition to objecting in court. Visa, MasterCard, and issuing banks can scuttle the settlement if merchants that account for 25 percent or more of credit card spending in the United States since 1 January 2004 to the approval of the settlement. The NACS is strongly encouraging its members to opt out. Hank Armour, president and CEO of NACS said, "It is important to note that if you do nothing, it will be presumed by the court that you accept the terms of the proposed settlement. Even if you submitted a declaration objecting to the proposed settlement last fall, you must respond to the notice and submit something in writing again if you want to opt-out of or object to the proposed settlement." The NACS has created a website dedicated to encouraging merchants to opt out that provides detailed instructions on how to do so. The Retail Industry Leaders Association (RILA), whose members include many prominent retailers such as Best Buy and Wal-Mart, opted out of the proposed settlement and urged its members to do the same. Deboarah White, a senior RILA official, said, "RILA and the overwhelming majority of our members agree that the proposed class action settlement is a bad deal for retailers." RILA members are legally required to opt out on their own. In January 2013, the United States Court of Appeals for the Second Circuit ruled that any appeals against the settlement that received preliminary approval in November 2012 would not be heard until objections to the settlement are filed and considered by the trial court in September 2013. The practical effect of this ruling was to allow settlement notices to be sent to eligible merchants. In June 2016, the United States Court of Appeals for the Second Circuit overturned the settlement on the ground that class counsel could not adequately represent merchants who has a significant interest in the monetary relief provided by the settlement and merchants who could only benefit from the prospective injunctive relief. In April 2013, the three law firms appointed to lead the plaintiffs in this case asked for $720 million in fees. If approved this would be one of the largest awards of legal fees in American history. They argued that such high fees were reasonable given the amount of the settlement and the risks and complexity of the case. This dollar amount represents about 4.5 times what would normally be billed at an hourly rate for the work performed. Approval of these fees partially depends upon approval of the settlement. The law firms in question are Robins, Kaplan, Miller & Ciresi; Berger & Montague; and Robbins Geller Rudman & Dowd LLP. Any fees awarded will be split among about 40 different law firms. The distribution of fees is normally decided by lead counsel. Judge Gleeson retained Alan Sykes as an independent expert in order to help the judge evaluate the proposed settlement. Gleeson said he appointed Sykes would "advise the court with respect to any economic issue that may arise in connection" with final approval of the settlement. Gleeson mentioned appointing an independent expert during the hearing on preliminary approval in November 2012. He informed the parties in March 2013 that he was considering Sykes, a professor at New York University's law school. According to a resume published by the court, Sykes previously taught at Stanford and the University of Chicago and has published several books and scholarly articles on economics and trade. No party objected to the appointment of Sykes. While parties routinely make use of experts to support their positions, judges rarely exercise this option. In addition to Visa and MasterCard most of the largest credit card-issuing American banks such as JPMorgan Chase, Bank of America, CitiBank, Wells Fargo, and Capital One are defendants in the case. Named class plaintiffs include the National Association of Convenience Stores, the National Grocers Association, the National Restaurant Association, the National Community Pharmacists Association, and 15 others. Co-lead class counsel include Laddie Montague, Merrill Davidoff, Bart Cohen, and Michael Kane of Berger & Montague; Craig Wildfang, Thomas Undlin, and Ryan Marth of Robins Kaplan Miller & Ciresi; Patrick Coughlin, Bonny Sweeney, David Mitchell, Alexandra Bernay, and Carmen Medici of Robbins Geller Rudman & Dowd. Counsel for Visa include Robert Vizas, Robert Mason, Mark Merley, and Matthew Eisenstein of Arnold & Porter. Counsel representing MasterCard include Keila Ravelo, Wesley Powell, and Matthew Freimuth of Willkie Farr & Gallagher; Kenneth Gallo, Joseph Simons, Andrew Finch, and Gary Carney of Paul Weiss Rifkind Wharton & Garrison. This case is formally known as In re Payment Card Interchange Fee and Merchant Discount Antitrust Litigation. The docket number is 05-md-01720. The United States District Court in the Eastern District of New York in Brooklyn is the venue. ^ a b c d e f g h "Visa Mastercard fee deal falls too short retailers claim". Business Week. November 9, 2012. ^ a b c d e "Visa Mastercard 7.3 billion settlement over credit card fees". NBC News. July 14, 2012. ^ "Court approves controversial interchange fee settlement". Bank Credit News. December 17, 2013. Archived from the original on January 16, 2014. Retrieved January 14, 2014. ^ "EPC: NRF appeal of interchange settlement a "political ploy"". Bank Credit News. January 10, 2014. Archived from the original on January 16, 2014. Retrieved 2014-01-14. ^ a b c "Lawyers in $7.25 Bin Credit Card Settlement Seek $720 Min in Fees".